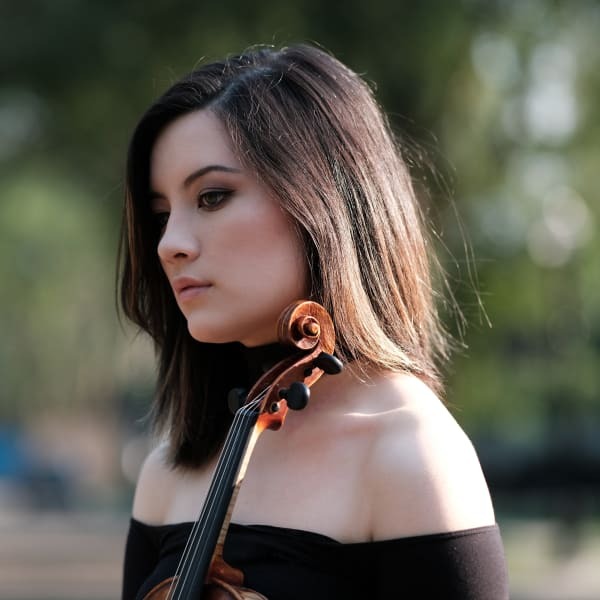 Canadian-born violinist Gabrielle Després has won numerous local, provincial, and national competitions, including prizes in the nationals of the Canadian Music Competition in both violin and piano. Gabrielle has performed twice in the Winspear Centre with the Edmonton Youth Orchestra as winner of the Northern Alberta Concerto Competition. In 2016, she was featured on Radio-Canada’s nationwide television show, Virtuose, placing second out of 24 young Canadian artists on this weekly series. In 2017, she was a top prizewinner in the national Shean Strings Competition. Gabrielle has had the opportunity to play for many renowned musicians, including Midori, Ida Kavafian, Mihaela Martin, Daniel Phillips, Stephanie Chase, Andrew Wan, Jonathan Crow, and Robert Cohen. Her summer studies have included the Orford Summer Music Academy, the Morningside Music Bridge program in Calgary and Boston, and the Casalmaggiore International Music Festival in Italy. Gabrielle began violin studies at the age of 3 and studied with James Keene for nine years. She was a student of Robert Uchida beginning in 2016, and began studying at The Juilliard School for her Bachelor of Music degree under the tutelage of Masao Kawasaki in September of 2018. Gabrielle acknowledges the generosity of the Alberta Foundation for the Arts, the Anne Burrows Music Foundation and the Edmonton Community Foundation in supporting her education.